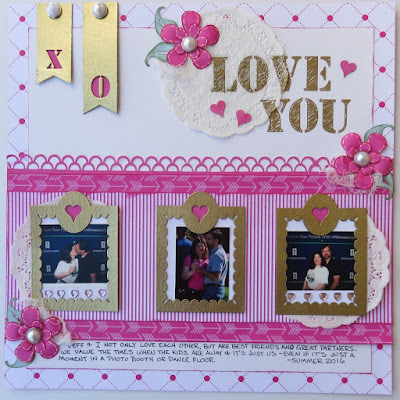 Blog Quick Quotes: Loving You with June! Hello and welcome, June here today to host the blog. This month's Club Q is fill with the beautiful Winter Bliss papers. I started with Winter Bliss 102 and adhered a 10-1/2" square white cardstock edged with Fuchsia PowderPuff Chalk Ink to the center. Then a doily was added to the upper right. Use the chipboard banners (that come in the kit) as stencils. I made the "LOVE YOU" title with a gold paint pen, coloring right over the doily! 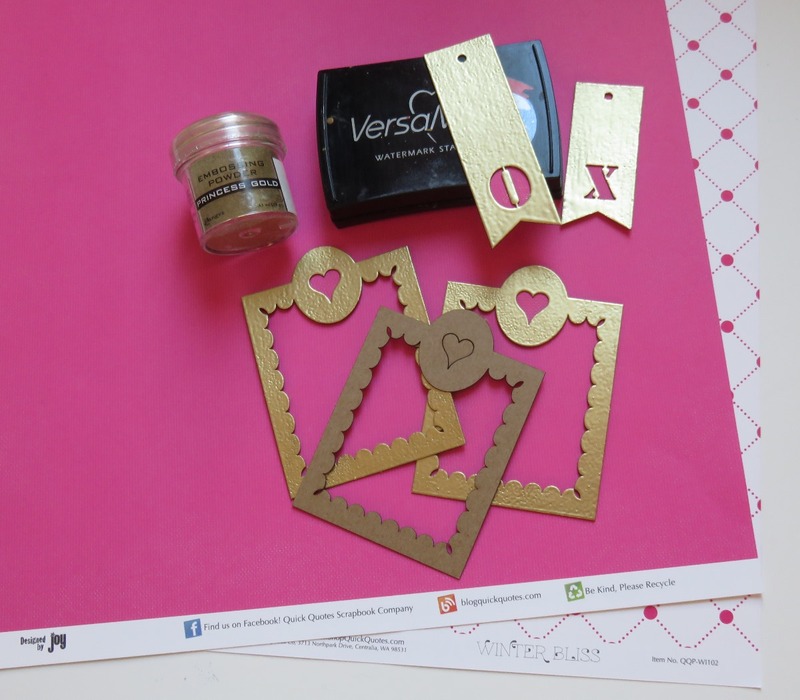 To add some glitz, I took 3 of the cute heart frames and XO chipboard banners (these are also in the kit), smooshed them into Versamark Ink and heat embossed them with gold embossing powder. 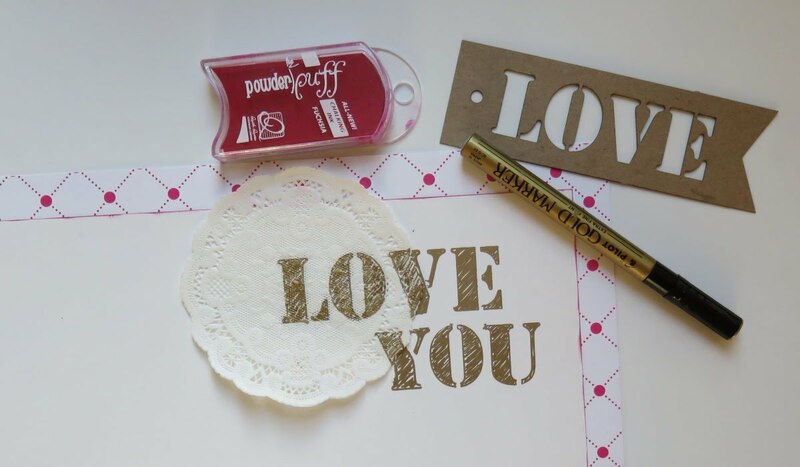 Super easy and a great way to jazz up your Quick Quotes chipboard. 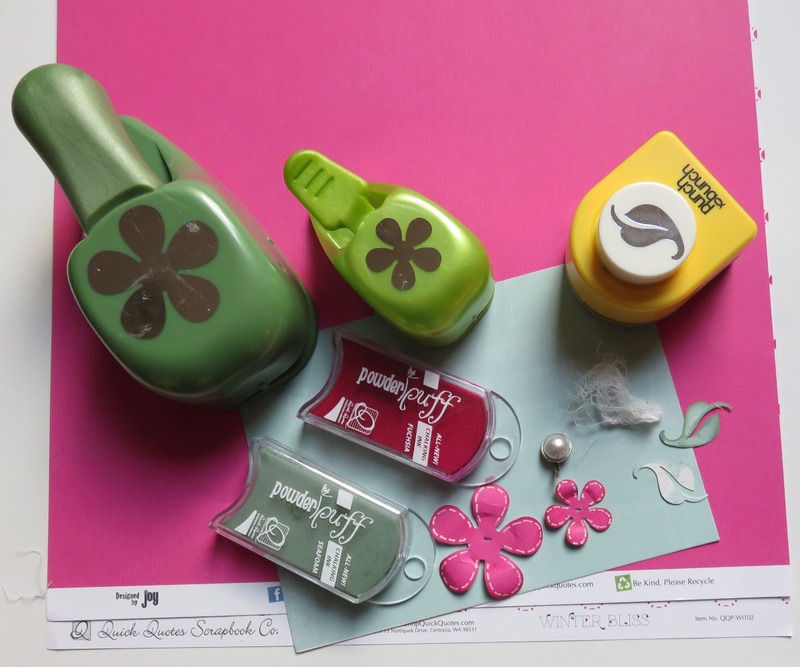 To make the fun embellishment flowers, I punched 3 big flowers and 3 small flowers, edged them with Fuchsia PowderPuff Chalk Ink, and added faux white stitching with a white gel pen. A large pearl brad (from February's kit Add-On #2) was added to the center of each of the flowers. The leaves were punched from Chiffon 101 and edged with Seafoam PowderPuff Chalk Ink. For texture a little cheesecloth was added. The pink hearts in the title are from the frames and were painted with gesso and colored with Fuchsia PowderPuff Chalk Ink. Next, I cut a 4" x 12" (stripes) and a 5" x 12" piece (arrows, reverse side) from Winter Bliss 100. 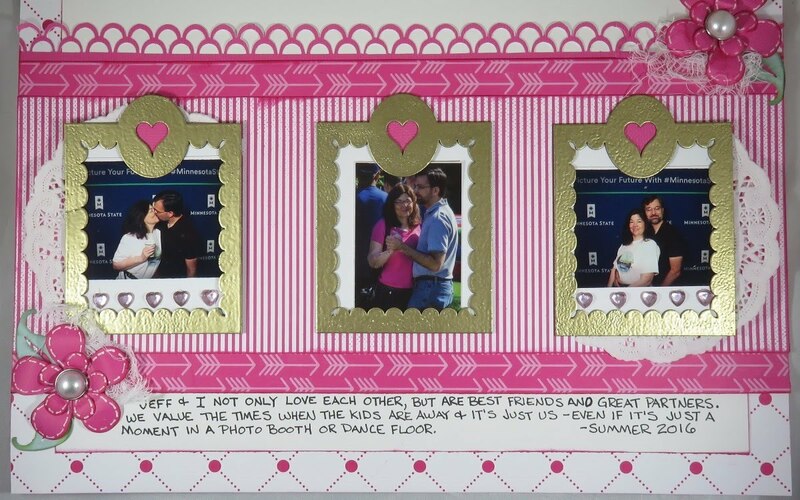 After edging them with Fuchsia PowderPuff Chalk Ink, I layered them and added the framed photos and heart gems. I also added a decorative border cut from Winter Bliss 102. Lastly, I adhered the embellishments and wrote the journaling across the bottom. Great post, love the ideas of heat embossing the chipboard, and the gesso to the chipboard is an awesome idea as well. Wonderful project.